In reference to the Mi’kmaq warrior society being targeted and raided I spoke in the interview about the similarities it had to the raid made by INSET (Integrated National Security Enforcement Team – Canada’s counter terrorism law enforcement department) against Dave Dennis and I.
I wanted to add that these similarities are not coincidental. They are part of an overall strategy at defeating any grass roots movement. Stratfor, is a US company, created by former Delta Force (U.S. Army Counter terrorism unit) operatives. After leaving the military the owners of the company utilized and modified a war strategy model of counter-insurgency to be employed against grass roots movements opposing corporations. Stratfor was hired by Philip Morris Tobacco Company and Nestle to utilize this counter grass roots movement model. In this model, Stratfor labels activist into four categories – (1) Radical (2) Realists (3) Idealist (4) Opportunists in order to determine strategies against each of them. Warrior societies fit into category 1, the radicals. Radicals are those individuals that will stand up for what they believe in and will not compromise. These are dangerous individuals to a corporation as they won’t sell out or be swayed by corporate propaganda. Stratfor’s strategy for dealing with radicals is to isolate them from the rest of the movement. They want to remove the core of the resistance by removing or alienating the radical from the majority of movement members. It’s about creating the divisions needed in a divide and conquer strategy. The radicals get isolated by propaganda, agents of influence, psychological actions (Psy Acts) until divisions are created and nurtured to the point that the radicals are vulnerable to actions from the government, such as a raid or arrest. Is this starting to sound familiar now? There has been a lot of discussion and debate around the strategies of peaceful and legal protest versus direct action. This is such a long running debate in resistance actions that it becomes the obvious “line of persuasion” utilized in psychological operations to divide a resistance group, if you were a corporation looking to do so. It is no surprise that this divide was created (?) and exploited by the RCMP. It plays well into their strategy of alienate and isolate the radicals. 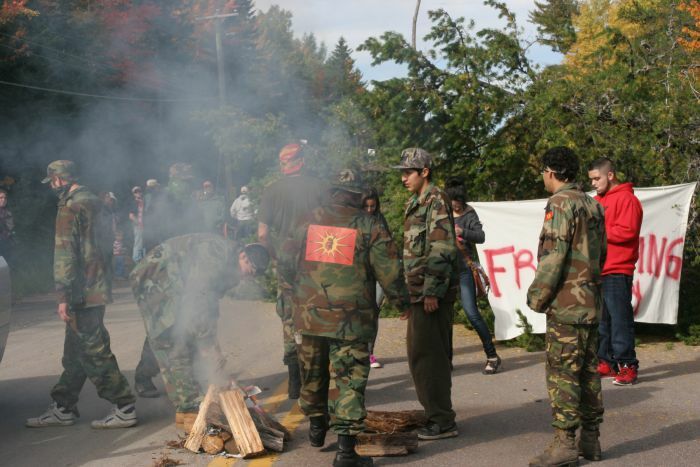 Warriors build fire on road during blockade of SWN vehicles, Oct 2013. The RCMP conducted their media operations after the raid to justify their decision to conduct the operation. To “justify” their operation the RCMP had to vilify the warrior society and their tactics of direct action. The RCMP had to convince Canadians that the warrior society was a real dangerous threat to the public. By casting the warriors into the villain role of a colonial storyline the corporations get to look like the innocent victim that needed protection. The corporations cannot be perceived as a victim to Canadian society without having a big bad villain, the warriors. It’s important that we acknowledge the way the story is being framed by government and industry so that we can see their intentions. Look at the fact that the justice system is keeping several warriors in jail. This is a great way of maintaining their isolation from the rest of the movement. The warrior society now has to focus on the legal issues of their members in jail and trying to free them. In time, the influence of the warrior society amongst the movement members will diminish with their absence. The lack of their influence means the movement may shift directions and move onto another completely different (or semi-oppositional) strategy than one the warrior society would have proposed or participated in. By the time they are out of jail and re-join the movement a new strategy with little warrior society input may have been adopted and employed leaving a reduced role for the warrior society. 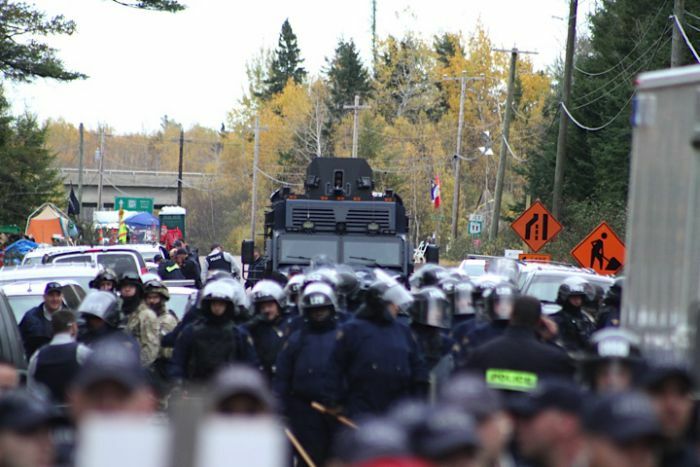 Colonial terrorism: RCMP Tactical Armoured Vehicle lurks in the background behind riot cops, Mi’qMak territory, Oct 17, 2013.
into submission. Strategies of “pacification” have been around and employed against Indigenous people consistently for centuries. The immediate or short term objective of the raid was to isolate the warrior society but the long term objective is to strongly discourage any other movement members from pursuing a similar strategy of direct action. The raid “terrorizes” the movement members, supporters and community members from taking any real effective action and it sets an example to other direct action groups as to what to expect when you take on a corporation in Canada. Colonial terrorism is alive and well in Canada today. 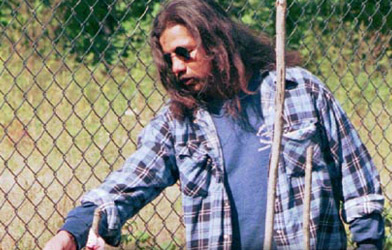 Dudley George, shot and killed by Ontario Provincial Police on Sept 5, 1995.
protester. Dudley would have been the “martyr” of any pacifist resistance strategy but there was no Canadian reaction worth noting to his murder by the police. If a resistance movement cannot effective mobilize the mass support critical for those kinds of strategies then their power has to lie elsewhere. True Indigenous resistance power comes from the ability to confront raw colonial power with direct action. We know that the governments’ agenda is to promote, support and protect corporations at the expense of Indigenous nations and people as well as at the expense of their own people. Knowing this you have to ask “why does the government adamantly insist that Indigenous resistance has to be confined to peaceful and legal protests?” unless they have determined that those strategies keep the movement within the governments sphere of political, economic and legal control. To add to this you must ask the opposite “why does the government aggressively demand that Indigenous resistance cannot use direct actions in the protection of their freedom, their nation and their self-determination despite the fact that Canada uses those ideas as justification for the use of their military force in foreign nations?” The government knows that direct action utilized in de-colonization strategies is very effective and wishes to deny Indigenous people a set of tactics that have a hope of being successful. 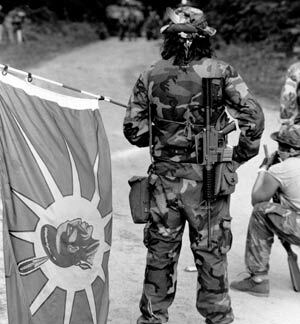 Warrior with warrior flag, Oka 1990.
disempower Indigenous resistance strategies by denying tactics of real effectiveness. The role of the “agent of pacification” is to infiltrate a movement and to oppose, counter, disrupt any measures that may use direct action. This takes the “wind” out of the resistance movement by creating ideological divisions that can get very heated. We have to be aware of the political, economic, legal and social environments that we exist in and how they contribute or hinder our possible strategies. When we understand these dynamics the big picture as to what the government seeks to do in their strategy becomes so much clearer. The last point I wanted to make was that the Protectors of Mi’kma’ki are at a critical point in their strategy right now. They are faced with a question of what direction to take in the face of state use of force. They can change tactics to a more state accepted approach of peaceful and legal direction or they can demonstrate a strong spirit of resistance and stay the course of direct action. Demonstrating a commitment to direct action negates the long term objective of the RCMP raid, to terrorize and pacify the movement, and it inspires the warrior spirit of our people. This frustrates the RCMP, instead of empowering them, and ensures the duration of the action is guaranteed to persist. Demonstrations of courage and honour also motivate others to get involved and can become a center point for social mobilization strategies. Think about it, when was the last time you got pumped up about an announcement of negotiations instead of acts of honour? The struggle in Esgenoopetitj taught us that the will of the community members was more powerful than raid after raid after raid by DFO and RCMP and that we can prevail. 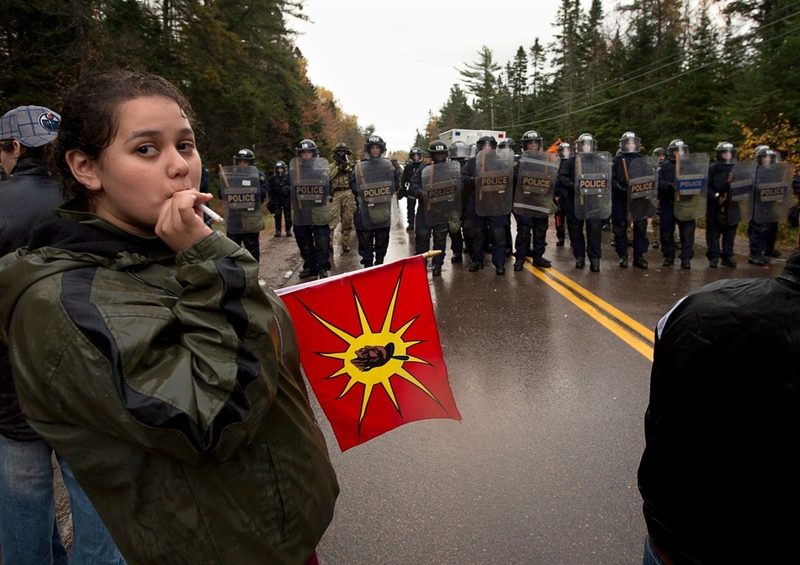 Posted on November 3, 2013, in State Security Forces, Warrior and tagged anti-colonial resistance, counter-insurgency, Indigenous resistance, Mi’kmaq, Mi’kmaq Warriors Society, native blockades, native protests, native resistance, RCMP, RCMP and Natives, repression, Sakej Ward, Stratfor, warrior, Warrior Society. Bookmark the permalink. 3 Comments. That is one of the few truly reasonable and accurate analysis’ on the situation and tactics used to diffuse resistance & isolate (divide & conquer) that ive read so far, in regards to the Mik’maq struggle. There are too many of our people being taken for fools by the state’s tactics, and it hurts watching our people play into the hands of the enemy by demonizing their own simply because they choose to act on what they feel needs to be done, as opposed to doing nothing & judging from the sidelines in the comfort of their colonized homes. The lack of respect and gossip is unbelievable. And the plain stupidity & self righteous ignorance. Some people will say anything to justify their own pacifism and inaction, even to attack and divide their own warriors, their people, those actually taking a risk for what they believe in, risking their freedom in colonial jail for a chance to save the land and themselves from being poisoned…Those spreading such dangerous and planned misinformation should re-read this and think about the implications of actions and words..especially when it only takes a click to repost such garbage. I agree. Indigenous people need to understand that we must use a diversity of tactics in our struggle as no one way is correct, and that denouncing, demonizing and slandering warriors and direct action plays into the counter-insurgency strategies employed by the state. I would also add that ‘agents of pacification’ come in many forms, from the ‘nonviolent activist’ urging pacifist protests (like many in the Idle No More camp) to the Indian Act chief and council and all the way up the head of the AFN. I would also recommend that people read Frank Kitson’s book Low Intensity Operations, a basic primer on counter-insurgency strategies used by the state.